If you are diabetic or are trying to avoid raising your blood sugar to maintain or lose weight, you may be familiar with the glycemic index, or GI. You may also be confused as to whether to incorporate fruit such as pineapple into your diet, since it has sugar. It is important to understand how the GI works and how to keep your blood glucose levels stable for health and fitness reasons. The glycemic index may appear complicated and complex, but it is fairly easy to understand. The GI is a quantitative numerical ranking system of how fast carbohydrate-based foods and drinks can potentially raise your blood glucose levels. In simple terms, the GI is a scale indicating how quickly a food raises your blood sugar level. High GI foods, or foods and beverages over 70, will raise your blood sugar and insulin levels quickly. Low GI foods, or foods and beverages with a ranking of 55 or below, will have a far less significant effect on your blood sugar and insulin levels. Pineapple receives a GI ranking of 66. At 66, pineapple falls within the upper-half of the medium GI range of 56 to 69. Unsweetened pineapple juice, however, receives a GI ranking of 46 -- 20 points lower than whole pineapple. This is somewhat anomolous, since most fruit juices that contain 100 percent fruit juice usually have GI rankings equal to or slightly higher than their whole-fruit source. Canned pineapple, packed in juice, has a similar GI to pineapple juice, at 43. However, some types of canned pineapple come packed in sugary syrup, which might increase the food's GI. 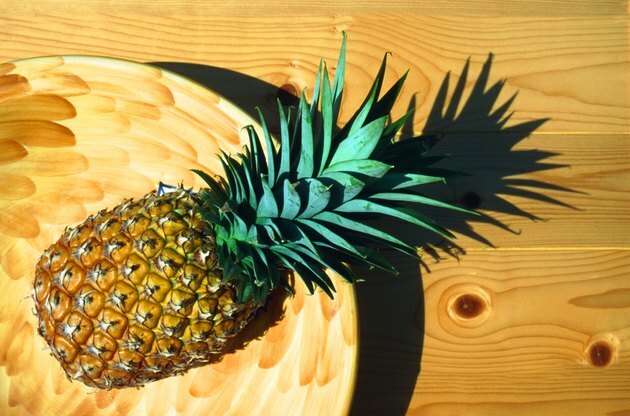 Pineapple has a GI ranking higher than most other fruits. Most fresh fruits without added sweeteners are among the low GI foods, with rankings below 55. For example, apples at 38, cherries at 22, grapes at 46, grapefruit at 25 and oranges at 43 all have GI rankings lower than pineapple. If you want to keep your blood sugar stable or low, these fruits, in the same quantity, are better choices. This is not to suggest that pineapple is a "bad carbohydrate" source or "not good for you." It simply has a higher effect on your blood sugar than most other fruits if consumed in equal quantities. If you are trying to lose weight, you also must consider the caloric content of a food or beverage and not just the GI. For example, pineapple has a GI ranking of 66, while vanilla ice cream has a GI ranking of 60. Although an equal amount of pineapple may raise your blood sugar and insulin levels slightly more than vanilla ice cream, vanilla ice cream usually has far more calories in the form of saturated fat and simple sugars that will be stored as fat. Eating pineapple is a far better choice than vanilla ice cream for weight-loss purposes. Fundamentally, losing weight is a product of creating a caloric deficiency, not simply avoiding carbohydrates and high GI foods.